.. Azel Hawkins Cemetery, Brookhaven Hamlet, NY, 23 Nov 2005, prior to cemetery restoration project by the Fire Place History Club. Pictured is John Deitz. This Hawkins cemetery, usually referred to as the Azel Hawkins Cemetery by local residents, is also know as the Deacon Daniel Hawkins Cemetery in some genealogical records. Neither name is descriptive; the largest number of headstone are associate with Azel's brother, Selah. And the first interrment is that of Selah's wife, Rachel Rose (1781-1825). 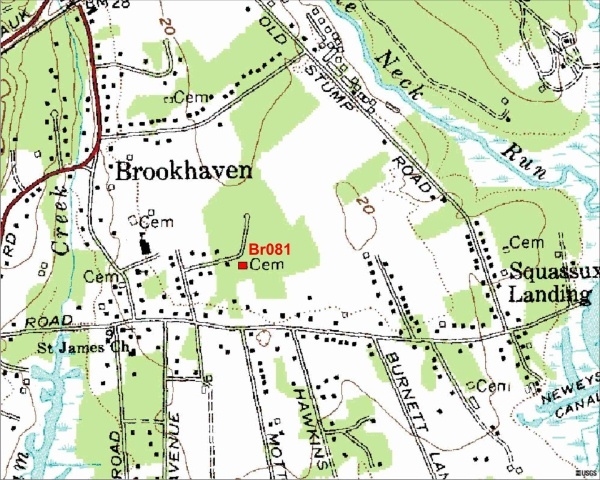 It is an approximately 80 ft east-west x 55 ft. north-south plot located approximately 125 feet south of Stillwood Road, in the Hamlet of Brookhaven. A right-of-way to the cemetery is off Stillwood Rd., approximately where Stillwell Rd. curves from east-west to north-south. While the right-of-way has been fenced-off by the neighboring property owners, the cemetery is accessible to pedestrians, and is easily made accessible for maintenance by removing fence rails. In this cemetery are buried some of the earliest "Hawkins" residents of Brookhaven Hamlet, who established homesteads and farmsteads along Beaver Dam Road. When I first visited the cemetery on 23 Nov 2005 for a brief inspection, the cemetery was heavily overgrown, unfenced, and poorly maintained. Although many of the stones themselves seemed to be in reasonably good condition considering their age, some monuments known to exist in 1939 could not be found, and a few others were down and perhaps vandalized. There is some evidence of encroachment by neighboring property owners. During the Summer of 2007, neighbors cleaned up the cemetery and removed much of the scrub growth, but by 4 July 2008 it had again become overgrown -- emphasizing the need for regular programmed maintenance. There is no evidence that the Town of Brookhaven has ever provided maintenance in accordance with the requirements of New York State Law. This cemetery has been placed on the project list for restoration during 2008-2009 by the Fire Place History Club.